Fasting may help people lose weight, but new research suggests going without food may also boost human metabolic activity, generate antioxidants, and help reverse some effects of aging. Scientists at the Okinawa Institute of Science and Technology Graduate University (OIST) and Kyoto University identified 30 previously unreported substances whose quantity increases during fasting and indicate a variety of health benefits. The study, published January 29, 2019 in Scientific Reports, presents an analysis of whole human blood, plasma, and red blood cells drawn from four fasting individuals. The researchers monitored changing levels of metabolites—substances formed during the chemical processes that grant organisms energy and allow them to grow. The results revealed 44 metabolites, including 30 that were previously unrecognized, that increased universally among subjects between 1.5- to 60-fold within just 58 hours of fasting. The human body tends to utilize carbohydrates for quick energy—when they're available. When starved of carbs, the body begins looting its alternate energy stores. 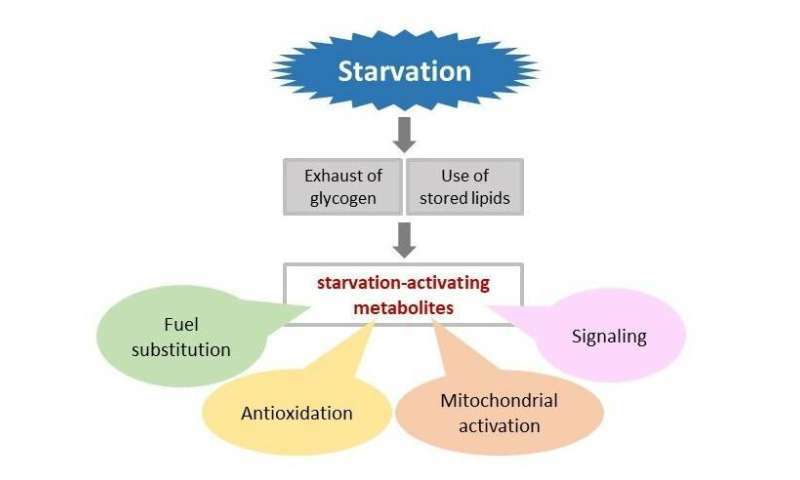 The act of "energy substitution" leaves a trail of evidence, namely metabolites known as butyrates, carnitines, and branched-chain amino acids. These well-known markers of energy substitution have been shown to accumulate during fasting.